working in the office of the embattled Chief Justice of Nigeria (CJN). The sprawling office, with adjourning offices, occupied by CJN’s support staff, located at towards the back of the Supreme Court complex, was cleared by the men. 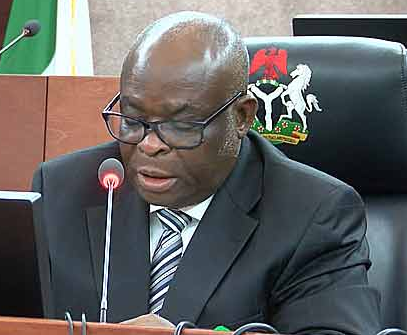 The suspended CJN, Justice Walter Onnoghen was not in the office when the incident happened. A source told The Nation that policemen arrived the CJN wing in the building around 7am and ordered everyone to leave. The source claimed the move was intended to prevent the suspended CJN from further accessing his office. “They came around 7am and ordered everyone to leave. They did not tell us why. We were not able to return to our office again until we closed yesterday,” the source said. Meanwhile the Code of Conduct Tribunal (CCT) yesterday adjourned indefinitely, proceedings in the case against Onnoghen. Tribunal Chairman Danladi Umar announced the adjournment. 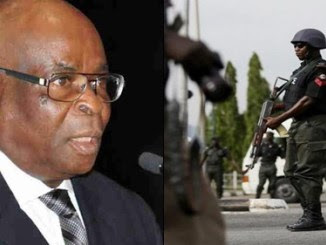 He said the tribunal wishes to await the decision of the Court of Appeal, Abuja, in a motion for stay of proceedings filed by the CJN and on which arguments were taken on January 24 this year. The tribunal commenced sitting at 11am, as against the usual practice where the tribunal sits by 10am. The court opened for business at its usual time yesterday, while the court’s digital cause list switched on at a little after 8am, displayed the about 11 cases scheduled for hearing for the day. At exactly 9.13am, proceedings commenced in Court One of the Supreme Court, when a five-man panel, led by the acting Chief Justice of Nigeria, Justice Ibrahim Tanko Muhammad began sitiing. The panel, which included Justices Mary Peter-Odili, Amiru Sanusi, Kudirat Kekere-Ekun and Paul Galinje conducted proceedings on cases.